The soon-to-be parents have inked a deal with E!—plus, find out how she's feeling! Rob Kardashian and Blac Chyna made headlines when they revealed their pregnancy just weeks after announcing their engagement—now, the famous couple is making waves again. We've just learned that they'll follow in the footsteps of Rob's family by starring in their very own reality series. According to E!, the show will be a six-part docuseries focusing on their relationship—from their engagement to when they learned of Chyna's pregnancy and everything in between. The working title, Rob & Chyna, doesn't reveal much, but we are hearing that the show will allow viewers to get a glimpse into how the rest of the Kardashians reacted to hearing about Rob and Chyna's new addition. 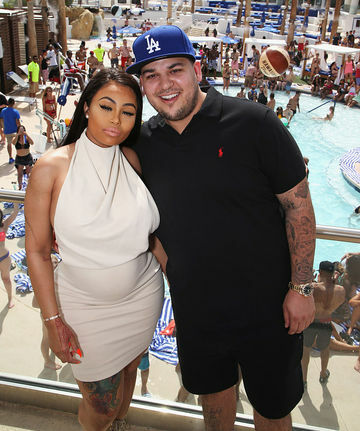 Needless to say, Rob and Chyna's relationship is certainly controversial—after all, Chyna's ex, Tyga (with whom she shares a son, King Cairo), recently split from Rob's sister, Kylie. While their situation is unconventional, it seems it's been smooth sailing where Chyna's pregnancy is concerned. Let's hope Chyna gets some of that energy back, as it's going to a busy year for the bride-to-be. In addition to planning her wedding, nurturing her pregnancy, and starring in the new reality show, Chyna will also co-executive produce the series along with Rob. It's set to premiere later this year. But as busy as the year is for Chyna and her fiance, it sounds like they're incredibly happy with all the new developments. "Rob and I are having a great time celebrating with our friends and family," Chyna told ET. "Everyone's happy! Things with Rob's family are fantastic."